January 2012, I was in L.A. on a Sunday afternoon to catch an early flight out the next day. 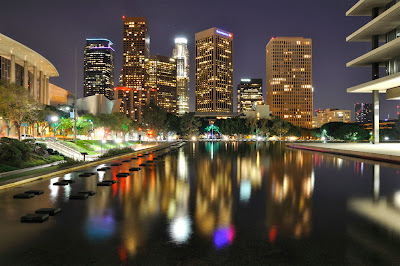 I was able to take an hour to explore the Silver Lake District and the famous "Music Box Steps." 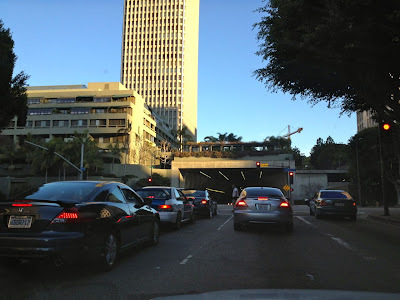 I had a bit more time, so I followed Sunset Blvd. 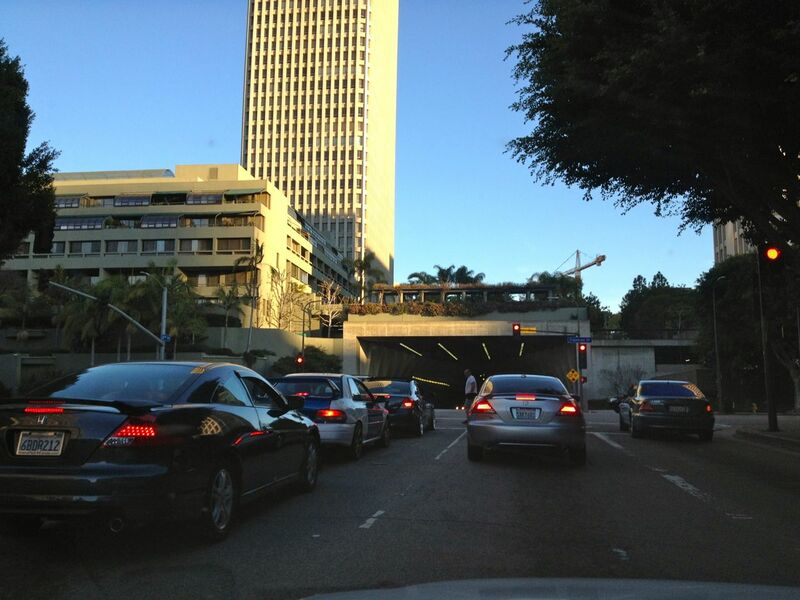 into downtown Los Angeles, veering off to explore Bunker Hill. Bunker Hill is home to a variety of office, residential, and public buildings, including the Walt Disney Concert Hall (above). 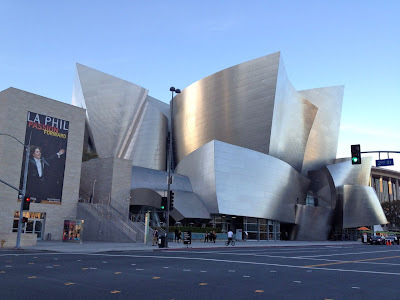 Designed by Los Angeles based architect Frank Gehry, the Concert Hall opened in 2003, and is home of the the Los Angeles Philharmonic Orchestra. It's been photographed thousands of times, and is quickly becoming, at least the outside, a "must see" attraction in Los Angeles. What is never photographed, and is certainly a "must miss" attraction is the parking structure directly across the street from the Walt Disney Concert Hall. This structure has been around since at least the late 1960's, when my parents first moved to California. We were from Chicago, land of lousy weather, but fantastic architecture. 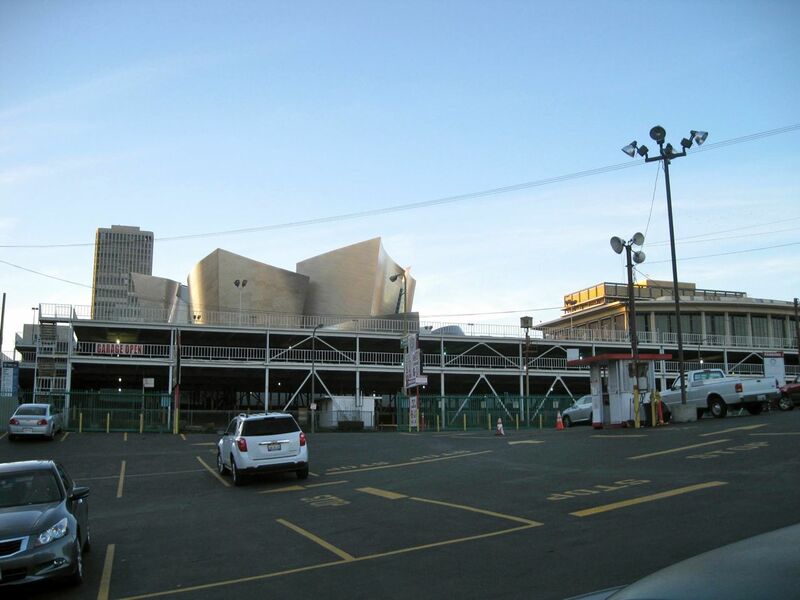 I distinctly remember how shocked my dad was that something so ugly could be in the heart of downtown. 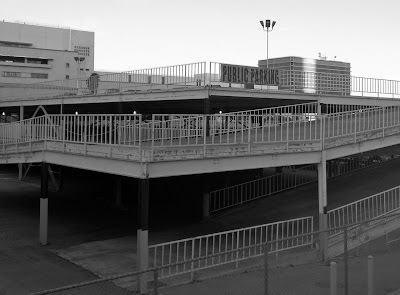 Apparently, this parking structure was erected as a quick "temporary" structure. 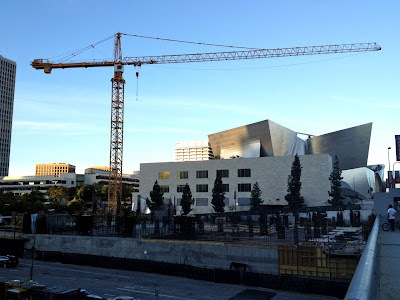 The idea was that in just a few years, an new building would take it's place. That was almost fifty years ago. Here's another. 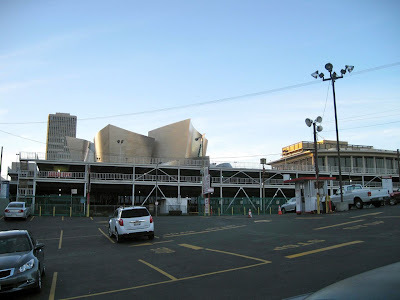 The city's ugliest parking garage - next to one of it's most amazing buildings. Yet another view. 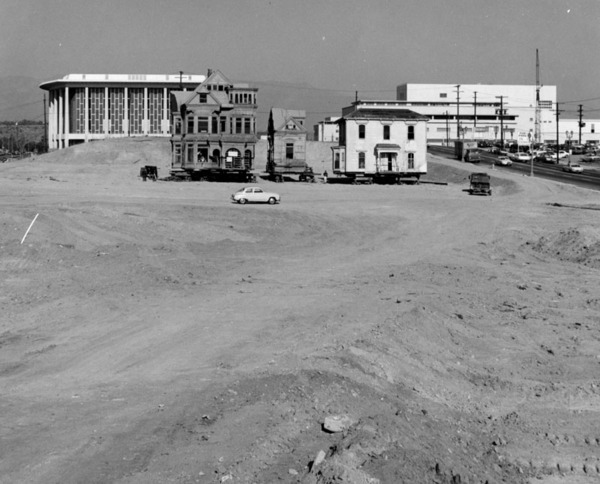 That's City Hall a few blocks away to the right. 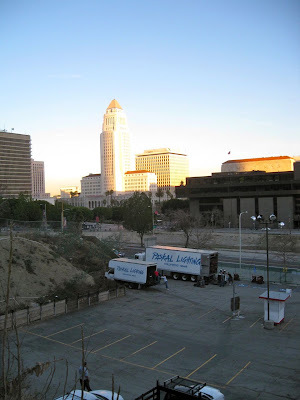 Getting closer to City Hall is another empty lot, another parking lot. Again, all this was suppose to be temporary. 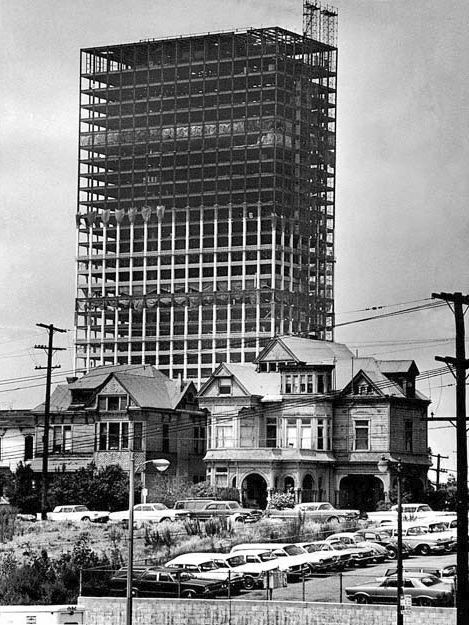 It's been sitting like this for almost fifty years. 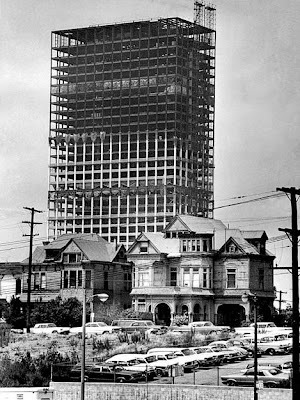 At the beginning of the 20th Century, Bunker Hill was one of the most desirable residential neighborhood within Downtown Los Angeles. 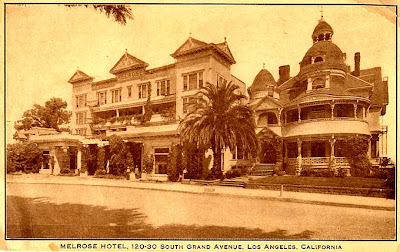 By the 1950's, the area had become a slum. Based on the urban planning models of the time, the entire area was completely raised. 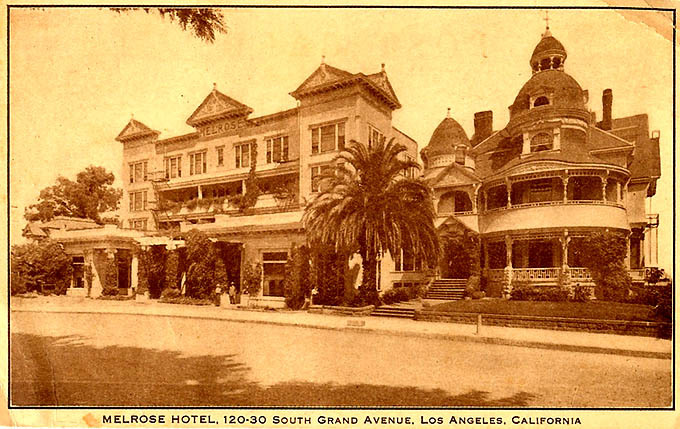 A small handful of the buildings were saved, and literally moved a few miles away. The steep hill was graded somewhat, and larger, wider streets were put in. 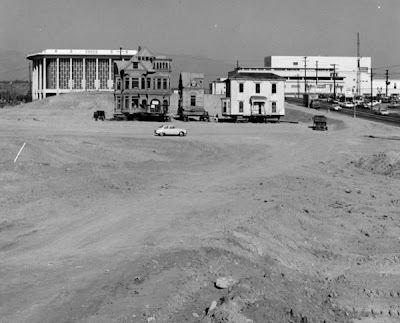 Bunker Hill in the 1960's: the remaining Victorian rooming houses, the Union Bank Building going up, and a parking lot. 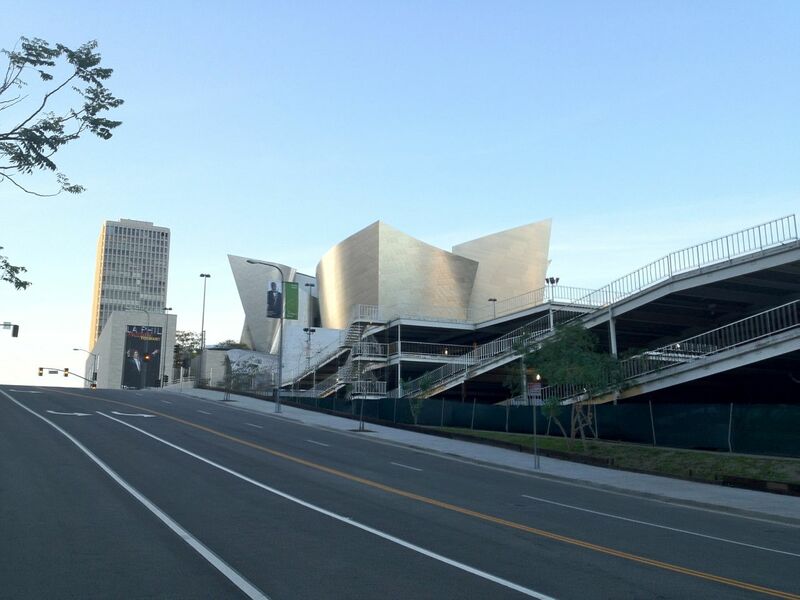 Today, after almost sixty years, Bunker Hill is almost complete as a financial, residential and cultural center. 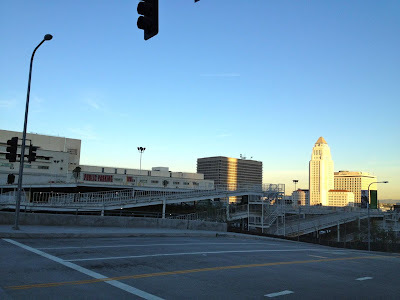 Downtown Los Angeles has an attractive enough skyline, but for a variety of reasons, lacks the energy of New York, San Francisco, or Chicago - at least in terms of foot traffic and walking out and about. 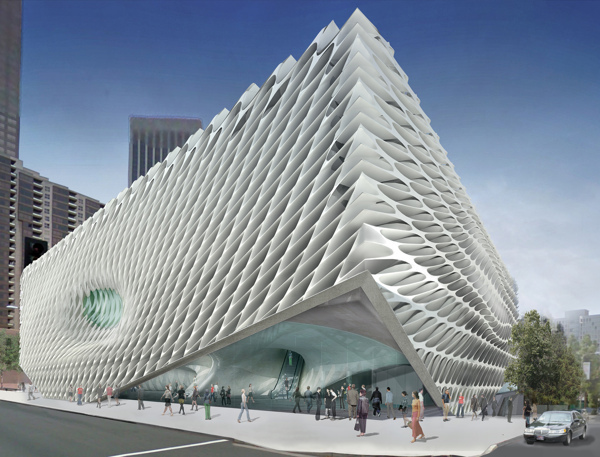 Meanwhile, next to the Walt Disney Concert Hall, billionaire philanthropist Eli Broad is financing the construction of The Broad contemporary art museum. 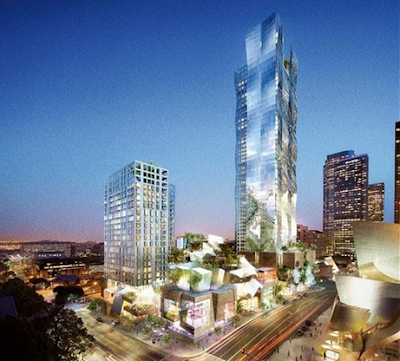 Here's a rendering of what it'll look like. Interesting design, although I hope they thought through on how to keep that "air-filter" design clean. The museum is scheduled to open sometime in 2014. So, after fifty long years, fifty LONG years, Los Angeles might finally be getting rid of this "temporary" parking structure. Here's a rendering from 2007 of "The Grand Avenue Project", what's planned for the final two open blocks of Bunker Hill. Plans for this space are - surprise - on hold again, this time because of the 2008 recession. A scaled back project is slowly moving forward. It's been almost half a century. 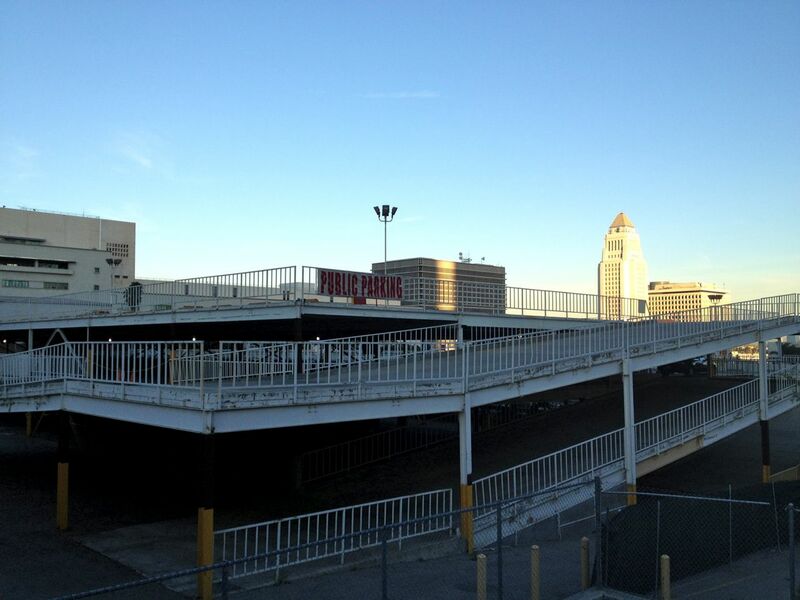 Hopefully, the city will have something better than a 50 year old "temporary" parking structure and a dirt lot - soon.